MG-SOFT MIB Compiler lets you compile any standard or vendor specific MIB file. The compiled MIB file can then be loaded and utilized by network management applications like MG-SOFT MIB Browser. Generally, a MIB file is usually supplied by the vendor of an SNMP manageable device and contains a description of the object hierarchy and object attributes in the managed SNMP device, i.e., the MIB file serves as a roadmap for managing that device. MG-SOFT MIB Compiler is available for Windows, Linux, Mac OS X and Solaris operating systems. MG-SOFT MIB Compiler consists of two main components, a command line MIB Compiler engine and a MIB Compiler GUI (Graphical User Interface) front-end. The MIB Compiler engine converts MIB files in MIB module language format (simultaneously supporting both SMI specifications: SMIv1 and SMIv2) into the MG-SOFT's proprietary SMIDB format. An application can access compiled MIB files through the industry standard WinMIB interface by using the WinMIB API functions implemented in the WinMIB.DLL module. The MIB Compiler GUI front-end provides a user friendly GUI interface to the MIB Compiler engine. Besides compiling MIBs, the GUI lets you use advanced features like batch-compiling groups of MIB files, scan MIB files to determine if all MIBs required for compilation are available, register new or moved MIB files, configure aliases for MIB modules, etc. 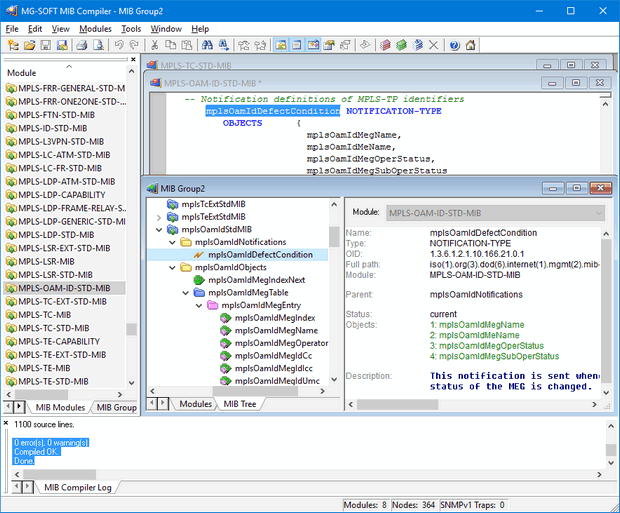 MG-SOFT MIB Compiler provides a user friendly environment for compiling MIB definition files. To compile MIBs, it is possible to run either the command line MIB Compiler engine or the GUI front-end application. While the GUI front-end definitively provides a user-friendlier way to compile MIBs, there are cases when you should use the command line version, for example when you wish to compile MIBs on the fly from a batch file or start the compilation from an application. While compiling, MIB Compiler checks if MIB module complies with the SMI rules for writing MIB modules. If inconsistencies are detected, MIB Compiler prints out meaningful error and warning messages. Doubleclicking a message will open the MIB file in the built-in MIB Editor and locate the inconsistent section, so that the user can fix it. In GUI front-end, once a MIB module is compiled it can be displayed in the MIB tree view, where you can see all nodes, symbols and traps defined in the MIB module. In the tree view you can see MIB node properties, print the tree and search the tree by specifying node's name or its OID (Object Identifier). You can build a MIB tree from many MIB modules by simply dragging the MIB module icons to a Database window. When compiled MIB module is saved to a database file, any WinMIB-based application (like MG-SOFT MIB Browser Professional Edition) can access and utilize the compiled MIB file. MIB definition module designers may wish to check the information about MG-SOFT Visual MIB Builder, an application for visual designing and editing of MIB module definition files.